As of 2012, the methods in which the construction industry fabricates a non-load bearing partition are virtually the same as 100 years ago: repetitive members, either wood or steel, are spaced at even increments with a finish skin applied directly to the structure. This process and assembly is perpetuated by a construction culture that thrives on convention. Sheet building materials are nominally controlled, assembly definitions and quantifications are outlined through building codes, and trades continue a system of apprenticeship where these techniques are passed down through generations. This is further complicated with a construction process that is the mediator between the conception of the designer and the built artifact. The aim of this research was to reconceive the conventional construction techniques of the traditional partition in high performance, technology-specific locations. These particular partitions often exhibit an incredible amount of inefficiency in systems integration where the space inside the wall becomes quite convoluted. This is a highly inefficient approach – one that begs for development within a contemporary fabrication environment where new computer numerically controlled technologies are able to translate mass-customized form into full scale, built assemblies. Section perspective showing integral systems arrangement. perfor(M)ations was a design research project lead by Assistant Professor of Architecture Brian Kelly which investigated the potential of a fully digitally fabricated, high performance interior partition placed within the healthcare environment. Working within charges established through various architects including Tom Wiscombe, Kelly saw potential in a refocusing of the design lens to the assembly, a part to whole approach employing techniques of mass customization and complete systems integration. Initial research indicated areas which design could assist in better delivery of healthcare, specifically in the patients’ exposure to air and surface contaminants. Altering the ways healthcare providers enter and exit the room, as well as the way air is moved through the room could better protect the patients in these facilities. 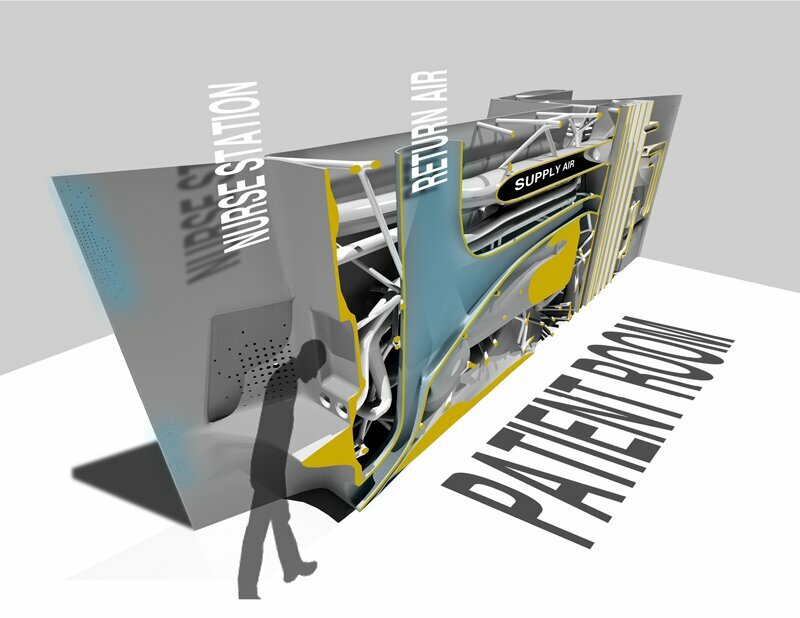 Additionally, research aimed to integrate the inclusion of digital form generation and fabrication techniques to consider the partition of tomorrow – one that allows synergy between the form, space, and various building systems. This synergy was manifest through the manipulation of the tactile patient room surface in combination with the varying thickness of the internal space. Exploded perspective in a healthcare context. The design process investigated areas of acute care patient rooms, structural surfaces, architectural wall infill (poche), narrow spectrum sanitary lighting, adjustable and variable perforation, and patient room air ventilation. Critical anthropometric wall sections (nurse station, sanitation area, task surface, etc.) were established to address use requirements through pushing and pulling the wall surface, accommodating various technical concerns. This, in turn, generated a dynamic interior partition that, with the parametric definition, is mass customizable for integration into both new and existing construction. Simultaneously, ventilation routing, which required the most poche space allocation, was conceived of as a morphing volume that was sometimes independent and other times grafted into the surface through delamination. Variable perforations into the surface eliminated the need for air and light diffusers, allowing for appropriate volumes and quantities to be delivered to the point of need. This process culminated in the manifestation of a 3D printed scale mockup of the partition with all systems present. 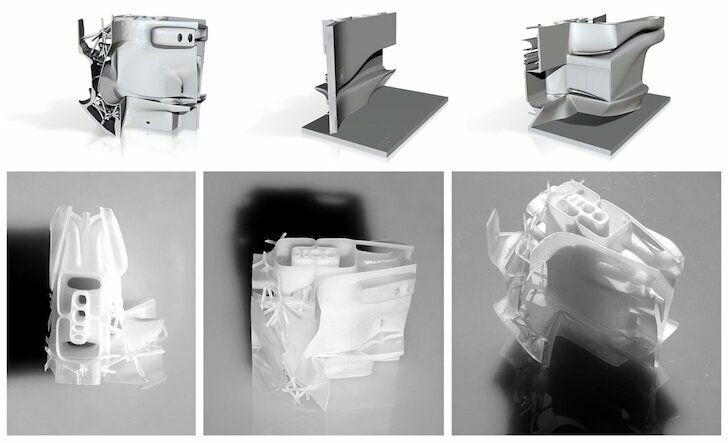 The inclusion of these systems in the 3D print allowed for parametrically controlled modification and skin adjustments responding to criteria such as structural stresses, bypassing/bifurcating systems, and curtain air distribution. As well, this technique analyzed surface geometry and varied the monocoque structural skin in ways that added material and strength where necessary, and lightened the skin where not needed. HP2 features include integrally 3D-printed building systems such as sink, healthcare vitals data readout, and ventilation, hand, and surface sanitation through narrow spectrum lighting aimed to decrease the quantity of contaminates entering the patient rooms. 3d print mockups of the design. Current projections of this research speculate on the potential of large scale 3D printing as a means to establish better connections between the high technology systems being requested and a fabrication technique which is supportive of that endeavor. In the same way assemblies that require tight connections between all form, systems, and use (ex. automotive industry) are controlled through prefabrication, this proposal suggests that fully integrated partition design might best be served through a fabrication technique which is offering more control and precision from conception to realization. The future trajectory is to test fabrication at full scale with 3D printing technology, focusing on areas of high systems concentration and in turn to offer an alternative path for the future of high performance, technology-specific partition design. perfor(M)ations was funded through internal sources at the University of Nebraska College of Architecture. Brian M. Kelly is the 2010-2012 Robert Douglass Professor in Healthcare Design and an Assistant Professor in the Architecture Program. Research assistants engaged in the work include Greg Gettman, Andru Meiners, Hasib Momand, and Brent Pauba. 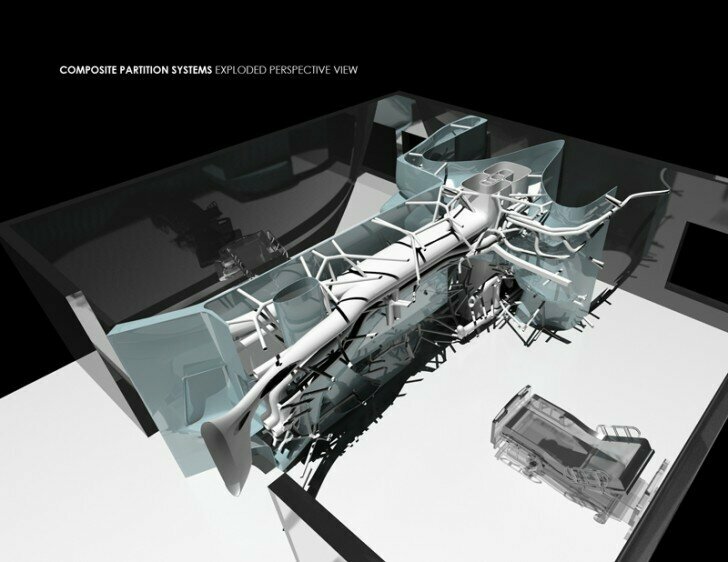 Tom Wiscombe, “Extreme Integration” Architectural Design Vol. 80, Issue 2 (2010): 79. For more information, contact Brian M. Kelly. Brian M. Kelly is the 2010-2012 Robert Douglass Professor in Healthcare Design and an Assistant Professor in the Architecture Program at the University of Nebraska College of Architecture.